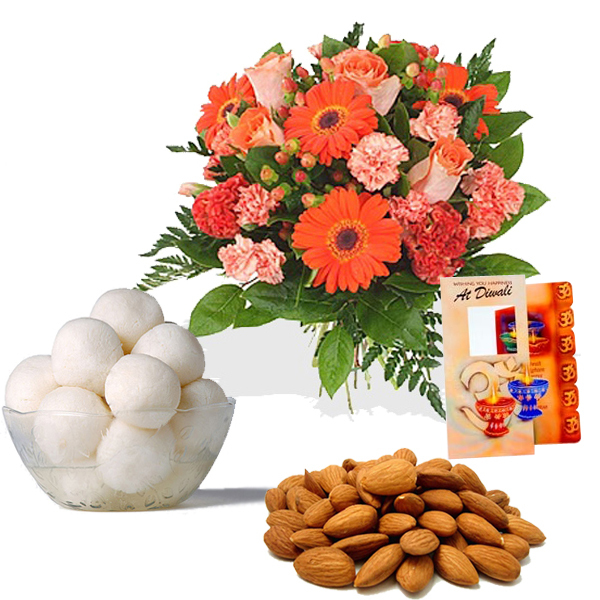 Product Consist : Diwali Card, 500Gms Rasgulla, 250 Gms Almonds along with Bouquet of 15 Pink and Orange Mix Seasonal Flowers with Lots of Green fillers. 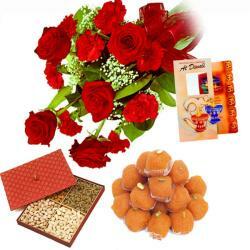 Diwali is occasion of sharing happiness and joyness by Gifting. 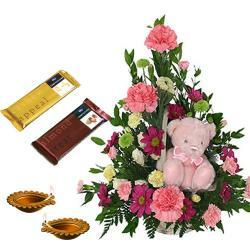 Sending of Gifts in any special occasion to your dear ones is a simple and effective way of telling them their importance in our life. 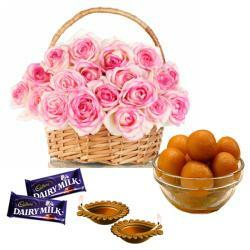 This special hamper contains all the items that are carefully handpicked to deliver happiness. It includes Bouquet of fresh flowers, 500 gram Arugula with Crunchy Almonds. 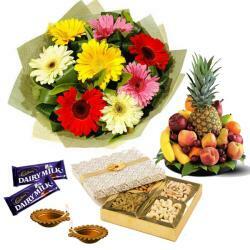 This fabulous Diwali gift combo of Flowers, Card, Dry Fruit and sweets is all set make your dear ones feel special. Product Includes : Diwali Card, 500Gms Rasgulla, 250 Gms Almonds along with Bouquet of 15 Pink and Orange Mix Seasonal Flowers with Lots of Green fillers.